On Easter Sunday, my three-year-old grandson comes into the church, looks around, and then points to the windows over the altar and says, “Rocket booster.” At first, puzzled by his choice of words I wondered, “A three-year-old knows about rocket boosters.” Then, I asked myself, “How did he make that connection?” Therefore, I took a second look at the stained glass windows over the altar. They have been there for over a hundred years and I guess that no one has ever thought of those beautiful windows as rocket boosters. Look at them, they are full of symbols: The Alpha and Omega from first chapter of Revelation, verse eight, “I am the Alpha and the Omega,” says the Lord God, who is and who was and who is to come, the Almighty…” There is the Rose of Sharon symbolizing love, health, and beauty; the grapes and wheat, the fruit of the earth, reminding us of the Holy Eucharist; and the crown and cross inspiring us to think of Christ’s victory over death and eternal life. 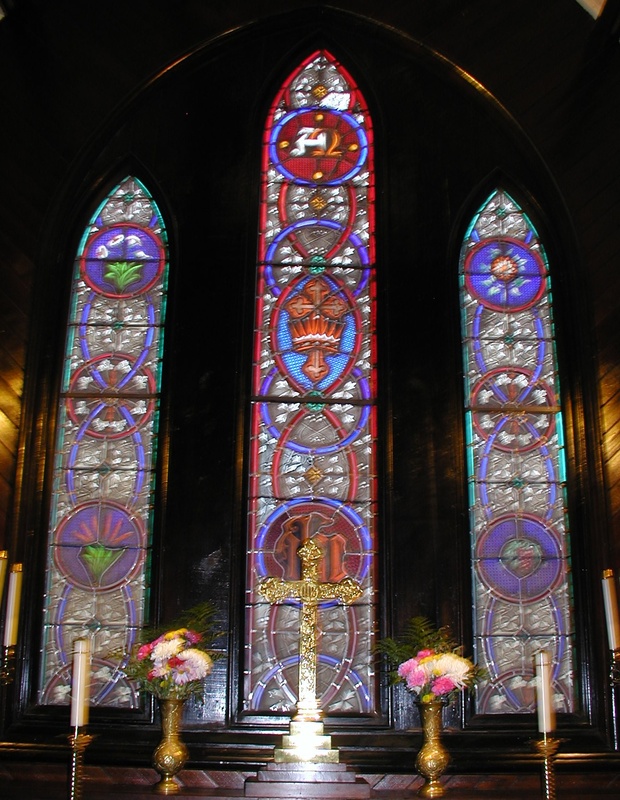 All that is in the symbols of those beautiful and antique windows you see every time you come into this old, but not worn out, structure to hear the word of God, to pray and seek forgiveness, and to be in physical contact with Jesus through the bread and the wine. However, my three-year-old grandson sees rocket boosters. You too can see them if you have the mind and imagination of an active three-year old. Let us look to see what he sees: The center panel is the rocket and the two side panels are the boosters. The rocket is poised for a trip to the outer heavens and if you have the imagination, you can go with it for a ride to the outer celestial boundaries of space. In addition, you can take that imaginative idea of a three-year-old boy to a different level. The windows appear to him to be a rocket with its boosters. Think of the Church as a rocket, or at least the booster rocket, that takes you to the nearer presence of God. Think of yourself as being a passenger on a space vehicle, a shuttle helping you see the earth and all of God’s creation in a larger way. When you are out in space, you see the earth as an island of blue against the black and empty backdrop. There are no boundary lines, no ethnic or racial divisions, there is just this beautiful planet and you realize how miniscule you are on it. In that view, you begin to understand that there is something greater than at work in the universe. From the distance of space, you can now gather that all that God has created is valuable and beautiful, and you love God’s creation even more. However, the Church’s role is not to take you to outer space but to make you aware that Christ’s sacrifice on the cross, his death and burial, is for the World. The call to repentance and forgiveness is to the World. As the Apostle John, in his letter to the Church, writes, the world has rejected the message (1 John 3:1b). Nonetheless, God has not rejected the world. If you stand back, as an artist does when painting a landscape, to see what is there, you will see what God sees, a world in need of love, repentance, and forgiveness. The world will not repent until the Church expresses the loving forgiveness of God, through Christ Jesus. Too often, the Church, instead of building rockets, builds tunneling devices, or digs trenches. Then instead of seeing the great globe of the earth as a place of love and beauty, many see it as the vessel of sin and destruction. There is no hope in that view of life. There is no faith in that view of life. The only hope in the entrenchment of the church is that it will survive and keep its resources so the building will not fall down or that the patriarchs and matriarchs will have someone to bury them when they die. Who wants to be a part of that sort of church? When you climb into your rocket, the boosters go off, and they propel you into space. There, in that rocket ship is opportunity for adventure, for risk taking, and for a new world. The new world in which you experience unconditional love, the care of those in need is a priority, and your individual focus is on something greater than you are. What does it mean to love, to repent, to forgive? Love is defined as wanting for another the same well-being and security you want for yourself. Don’t we all want that? Repentance is acknowledging deficiencies of love in one’s self. Forgiveness is a willingness to forgive those deficiencies of love in others and as importantly in one’s self. The message of the apostles after the resurrection was to acknowledge the power of love, to see the self-deception of individual pride, and then to reach beyond self to be willing to forgive. In those three actions healing takes place, change is possible and a new world is constructed. Cultural bias binds the Christian movement in this country. Overcoming cultural bias is difficult. Nevertheless, that is the task of the Church. Understand; when I use the word “Church”, I do not mean the institution alone (an institution I love). I mean every person who calls him- or herself Christian. If Christians do not hear a calling to proclaim the Gospel of love to the world, the Christian movement in the world will ultimately fail. In its place, the chaos of evil will prevail. Evil acts as a cancer in that it consumes its host to death. The Christian movement, the Church, when it is fully engaged in its mission to serve an oppressed world, brings light and life. Light is the source of life and gives meaning to existence. In light cancer, evil cannot live. All this may seem esoteric, that is, requiring too much thinking, but it is vital to the Church, its people, to change. Parishes do not exist solely to exist as chapels visited occasionally, but planted to be the earthly expression of Christ and his love on the earth. The Apostle Paul teaches that the Church is the Body of Christ and that each member of that body is essential to the whole. That also goes well for the world. You are a citizen of a single planet, a space ship that circles the sun. Can you imagine a space ship on which the passengers are arguing with one another for the entire trip? Instead of digging tunnels and trenches to avoid extinction, the people of God must go beyond fear of loss and think only in terms of gain. The people of God must either be the people who ignite the rocket and get on board if the message of Christ’s love is to prevail in a world engulfed in the darkness of sin and death. Always love your blog, Bill. Glad to see you are preaching and celebrating this Sunday. I am Supplying here at our parish on may 6th as our rector will be in a Prison ministry. After surviving cancer, i am so thankful not to be “put on a shelf”. We have a VERY pastoral Rector.